Recipes are meant to be shared! 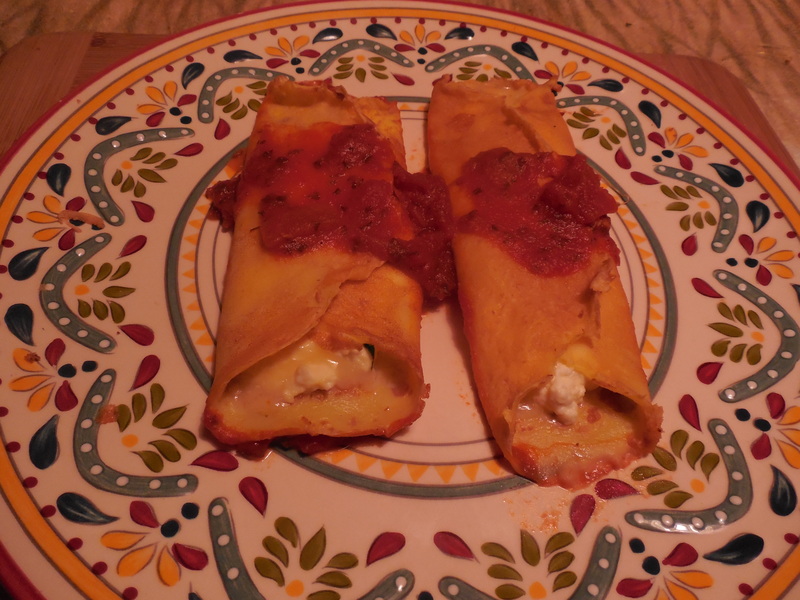 On this blog can be found classic Italian and Italian-American recipes that can be made at home, courtesy of the Italian-American Society of Peoria cooking classes. We’ve already tried out each and every one of these recipes. And not in a restaurant or chef’s kitchen – in our own homes! They’ve worked for us so we know they will work for you, too! 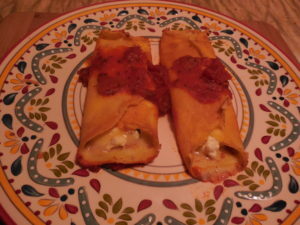 These recipes are also archived on the Learn Travel Italian website. Food is a big part of any culture, and that said, especially of Italian culture. Italians take great pride in the food they prepare and serve at home and in the many family run restaurants that dot the Italian landscape. Wonderful chef-driven restaurants abound in Italy as well. That is why the Conversational Italian for Travelers Phrase Book contains a special section on Restaurant Vocabulary! Take this pocket book of phrases along on your visits to Italy and read descriptions of the food you will be eating while in the restaurant, before you order! You may want to use our pocket reference book or our Conversational Italian for Travelers textbook even before leaving for your trip to Italy to learn how to read those restaurant menus ahead of time! 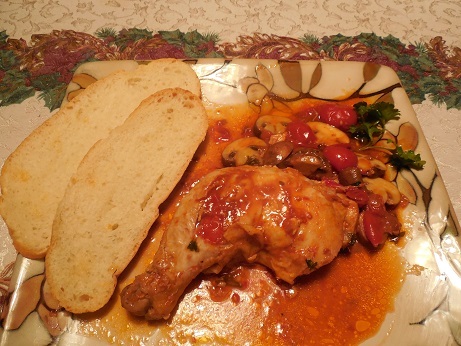 But, for now, experience some Italian cuisine at home by sampling our recipes! Follow our blog for a new recipe you will surely want to try about once a month! And visit our website at Learn Travel Italian for cultural notes and interactive audio dialogues to really feel a part of Italian life and culture! A delicious and easy to make family dinner. Try it tonight! 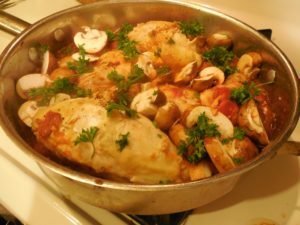 Try One-Pot Italian Chicken in Marsala Wine for YOUR Dinner Tonight! Sprinkle chicken lightly with salt and pepper. Pour olive oil into your pot or skillet to coat the entire bottom of the pot with a thin layer of oil, using about 1/4 cup of olive oil. Heat oil over medium high heat (do not let the oil smoke or flavor will be lost). Add chicken to the pan skin side down, keeping each piece separate from the other and cook without moving the chicken for a few minutes, until the skin has browned and some of the fat from under the skin has been rendered. Turn chicken pieces once and cook about 5 minutes more. Remove chicken pieces to a platter and cover with foil to keep warm. Pour out excess oil/fat from the skillet. Add fresh olive oil if necessary to coat the bottom lightly again. Into the skillet, add the chopped onion, crushed garlic clove, and guanciale or prosciutto. Cook until the onion has softened. Add Marsala wine and turn the heat up to high briefly to boil off alcohol while scraping the bottom of the pan with a wooden spoon to release chicken bits that will help flavor the sauce. Lower heat and continue to boil off alcohol until about 50% of the Marsala wine remains in the pot. Put the chicken back into the skillet and add tomatoes (with the juices in the can), mushrooms, and parsley. Add enough water, so the chicken and vegetables are almost completely covered. Cover the skillet and cook on medium high heat until the chicken is cooked through, adding more water as needed, about 15 to 30 minutes (this will depend on how cooked the chicken was initially, of course). Taste, and adjust salt and pepper before serving. Place the chicken pieces on a large platter or on individual plates. Pour on the sauce and serve with rustic Italian bread. 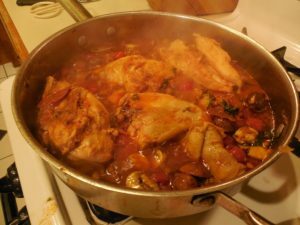 *This method is a fricassee of chicken (a method of cooking meat in which it is cut up, sautéed and braised, and served with its sauce), so the sauce will be a little fatty. If you want to decrease the amount of fat, the same method can be followed with skinless, bone-in chicken cooked for a shorter time initially. Minestrone Soup — A hearty and warming dish for the fall season or any time. Minestrone soup is common in Italy. So common, in fact, that the word “minestrone” is synonymous with “zuppa” or “soup.” When one mentions minestrone, what comes to mind is a bean and pasta soup, usually flavored with a bit of tomato. The beauty of this soup is that, aside from these three basic ingredients, almost any vegetable can be added. 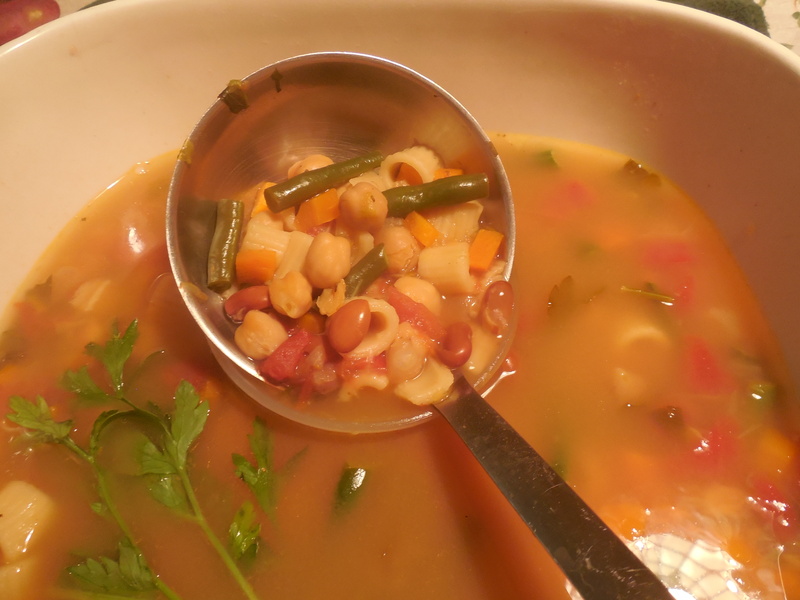 So minestrone soup can be made again and again and still add variety to your dinner table! Below is my family’s basic method for minestrone soup. The final soup is vegetarian, but the broth does use leftover meat bones and is a testament to how Italians traditionally use every bit of food they have at home. Ditto for the fresh parsley stalks. Why throw them away when they make a wonderful flavoring for soup broth? White beans (cannellini) are the most common bean to add to the homemade broth, but other types of beans can be substituted, such as pinto beans or kidney beans (but not black beans). Dried beans work best, but for shorter cooking times, canned beans can be used. Canned chickpeas are a nice addition. Any miniature pasta variety will work. 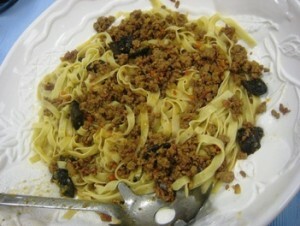 In a pinch, spaghetti can be cut into smaller pieces and added. If you have a bit of leftover cooked potato, green beans, zucchini, or another vegetable, add it to your minestrone soup at the end of the cooking time. A bit of leftover pork chop, chicken, or beef from the night before? Meat can be added as well. You will be following a long Italian tradition of not wasting food and at the same time turning bits of leftovers into something delicious! Fill a large stock pot with about 16 cups of water and set it on the stove. You may need a little more or less depending on the number of meat bones you have to make the broth. The amount of water should easily cover the bones and vegetables. Add all of the vegetables to the soup pot—carrots, celery, onion, clove of garlic. Note that these vegetables will be cooked until they have released all their flavor and will be removed before making the final soup, so there is no need to peel and chop them finely. Just wash, chop coarsely, and add to the soup pot. Turn the heat up to high and cover the pot to get it to boil. When the water comes to a boil, remove the lid and lower the heat to medium. Keep the water at a low boil and let the bones and vegetables cook slowly for 3–5 hours. Add additional water if necessary and continue cooking until the broth has the desired flavor and has reduced to about 8 cups. When the broth is done, the meat should be falling off the bone and the vegetables very mushy. Pour the broth through a colander with fine holes to remove any particulate matter, then store it in a large plastic container in the refrigerator overnight. If using dried beans, sort the beans in a bowl and remove any stones or beans that have not dried properly. Rinse and then place the beans into a non-reactive (plastic or glass) bowl overnight in cold water (about twice the amount of water as beans). Change the water once if you can. Place the skimmed broth into a large pot, about twice the size as the amount of liquid you have remaining. Add about 4 cups of additional water, becausse the broth will cook down again on the stove top. Add the dried beans that have been soaked overnight. Cook about 1 to 1 1/2 hours, until the beans have softened and started to fall apart. Note that the beans that dissolve will give the soup flavor and thickness, and about half the added beans will dissolve by the end of the total cooking time. The amount of cooking time to get the beans to soften to this point will mostly depend on how old your beans are (older will take longer) and how long you have presoaked them. When the beans have softened and started to fall apart, you can add your chopped vegetables—carrot, celery, onion, green beans. Add the can of chopped tomatoes, including the liquid and the dried or chopped parsley. Cook about 15–20 minutes on medium heat to soften the vegetables. Add the canned garbanzo beans and any other cooked beans or vegetables at this point. Add optional fresh parsley. Continue to cook on medium heat for about 15 minutes. Bring the soup to a boil and then add pasta and cook al dente (a little firm) according to package directions. 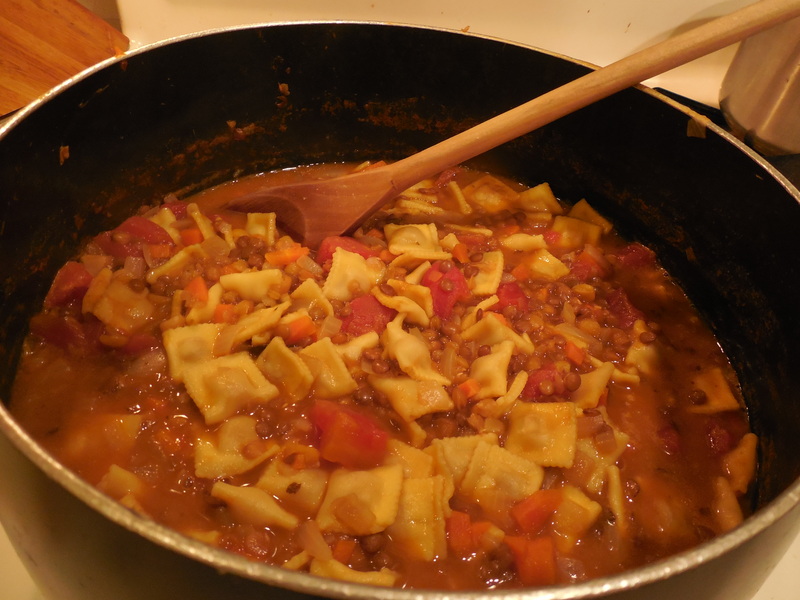 If not serving the soup right away, undercook it a bit, because pasta will absorb water as it sits in the soup. Onion: Halve the onion lengthwise. Turn each flat side of the onion half down onto the board. Cut through lengthwise, from one side to the other, following the vein in the onion. Then cut through crosswise to make pieces the same size as the other vegetables. Ripieno—The word for “stuffed” in Italian. And pork chops filleted and filled with prosciutto and Fontina cheese can only mean—delicious! Monday night is pork chop night at my home, a tradition started some time ago when my children were small and just starting to eat table food. 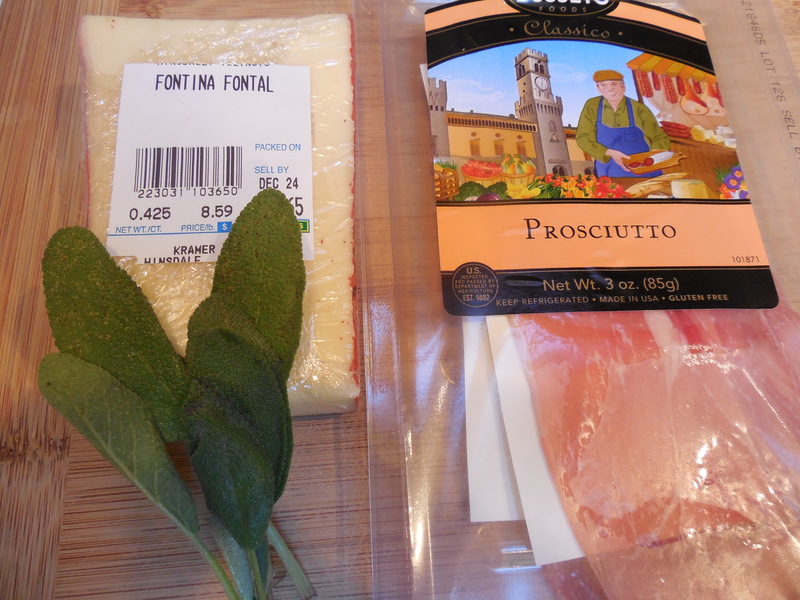 When the butcher has thick pork chops available, I like to use the trick of filling the pork chops with prosciutto and Fontina cheese to liven up our evening meal. As usual, for the recipes I post, the method is short and simple, so the dishes are easy to prepare at home. And the combination of delicious Italian ingredients will have your family clamoring for more! Fontina is a wonderful Italian cheese that has been made from cow’s milk in the Val d’Aosta region of Northern Italy since the 12th century. Fontina has a light yellow color, a soft but firm texture, and a slightly nutty flavor. Like mozzarella, but less well known in this country, it is used in dishes that require melted cheese. 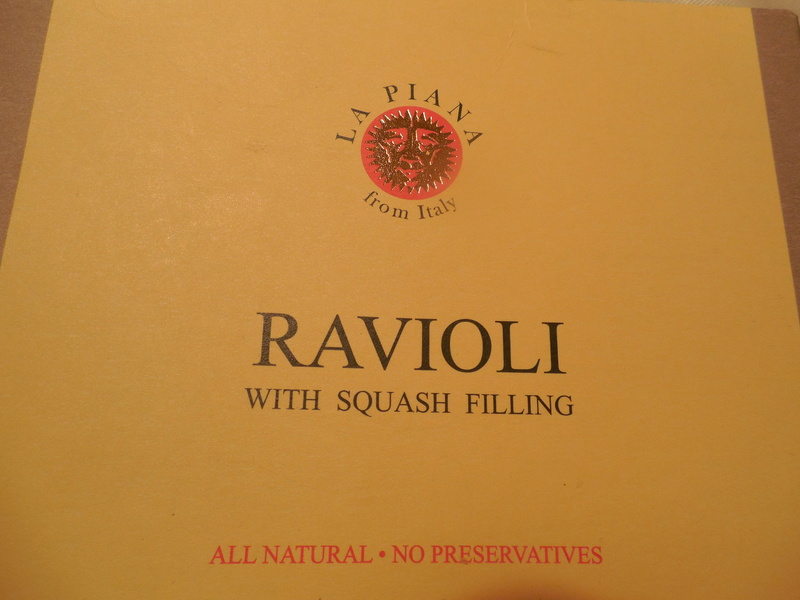 When paired with prosciutto and a single fresh sage leaf, it makes a delicious filling for… just about anything! 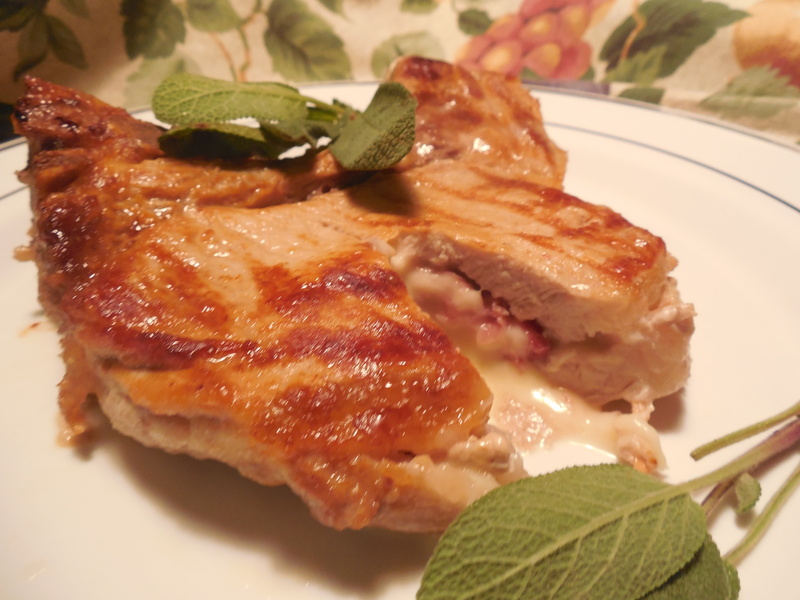 Pork chop filled with prosciutto, Fontina cheese, and sage leaf, cut and ready to eat. Lay out the ingredients for the filling. Take a rectangular piece of Fontina cheese and cover each side with half of a prosciutto slice. Top with a sage leaf. 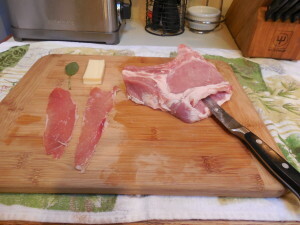 Lay the pork chops flat on a cutting board, and using a sharp, small meat knife, pare off the excess fat from the edge. Then cut parallel to the surface of the pork chop through the whitish membrane until you can feel the bone. 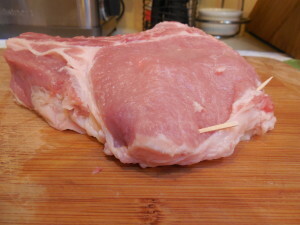 Gently separate the layers of pork chop with your fingers as you cut to create a pocket to hold the filling. 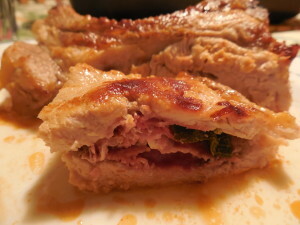 Filled pork chop with filling ingredients ready to package and insert. Insert prosciutto and Fontina cheese filling packets into the pork chop. Close the free edge of the pork chop with two or three toothpicks. Angle each toothpick through the layers of pork chop so the pork chop seals nicely and can lie flat. Heat about 1/4 cup olive oil in your favorite skillet or on a griddle. If you have a ridged skillet, this will create grill marks on the meat, but a regular skillet will work. Add pork chops and cook over high heat about 3 to 4 minutes to brown the surface. 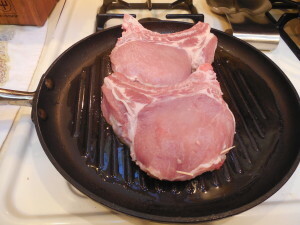 Two pork chops will usually fit in one skillet at a time. Try not to crowd the pork chops in the pan, so they brown properly. Place pork chops on the skillet along the grill ridges. Flip pork chops over and cook another 3 to 4 minutes over high heat to brown the other side. Flip pork chops back to the original side. If using a skillet with grill ridges, turn the pork chop 90 degrees when you flip it over to create a criss-cross pattern. Cover and lower heat to medium. Cook about 5 to 7 minutes. Flip pork chops over and cook over medium heat, covered, for another 5 to 7 minutes. 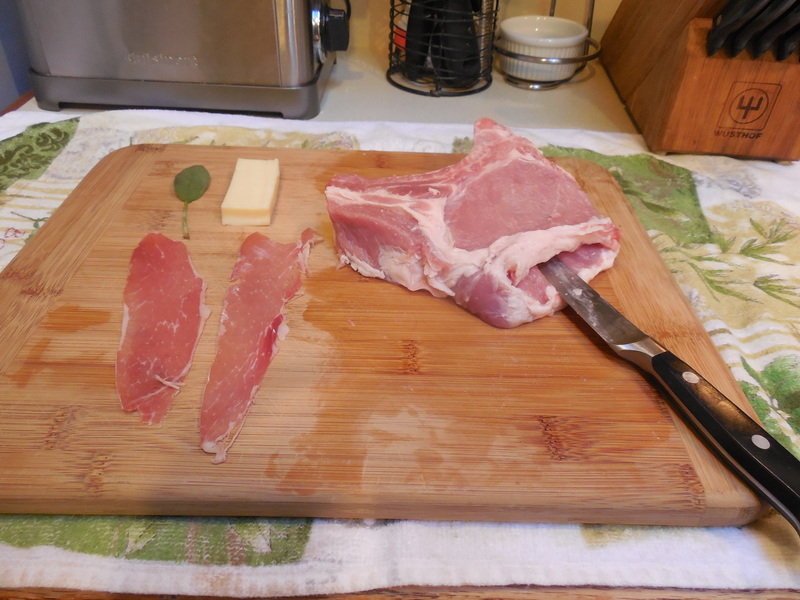 Test the pork chops by inserting a knife into the meat near the bone. If the juices do not run clear, cook an additional 5 minutes on either side, or until juices run clear. Remove from skillet and take out toothpicks. Set each pork chop in an individual dish, drizzled with a small amount of the pan juices. Watch your family’s look of amazement when they cut into the pork chops to find a delicious filling! Tartufo — Enjoy this chocolate-coated ice cream treat that is delicious enough for kids and special enough for adults! Tartufo: A gelato treat made just for summertime! The word Italian word “tartufo” refers to the round, brown-and-white truffles found in the densely forested Apennine Mountains that run down the spine of Italy. These slightly irregularly shaped round balls are found nestled between the roots of old beech, birch, and pine trees by specially trained dogs. A similarly shaped sweet French candy made from chocolate and cream, known as “ganache,” is also referred to as a truffle. We present here a method for a round, chocolate-coated ice cream treat made from vanilla and chocolate Italian gelato ice cream that is also called “tartufo.” In the version that follows, there is a surprise in the center—a real Italian marinated Amarena cherry. * Try our recipe as is, or make your own version with any of your favorite Italian gelato flavors. Enjoy a cold, refreshing treat this summer with our simple method! Tartufo: chocolate-covered gelato ice cream with an Amarena cherry in the center, cut in half and ready to enjoy! 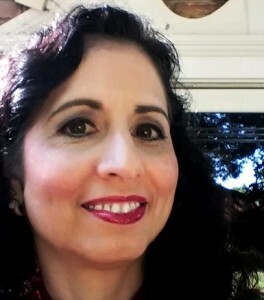 To see step-by-step pictures, visit Stella Lucente Italian Pinterest. Using an ice cream scoop, scoop out 4 balls of vanilla ice cream and place each ball on a piece of plastic wrap. Pull the plastic wrap above the ball and twist to seal. The same way, make 4 ice cream balls from the chocolate ice cream, wrap each ball in plastic wrap, and place the wrapped balls into a second freezer-safe container. Quickly return the container to the freezer. Freeze overnight. If you want, after the ice cream balls have refrozen, form them into a more rounded shape with the plastic still on and return them to the freezer. The next day, or when the ice cream balls have frozen through completely and are hard, remove one vanilla and one chocolate ball from the freezer at a time. Unwrap each ball quickly and save the plastic wrap. Turn each ball over so that the smooth, round end of each ball is facing up. Slice each ball in half and make a tiny well in the center of each half that is the size of half a cherry. Quickly press a cherry into the center of one of the ice cream halves, and then top with an ice cream half of the other flavor so that the final balls are half vanilla and half chocolate. Wrap each ball in the original plastic wrap again and place them back into the freezer container. Repeat the last 5 steps until all 8 ice cream balls have been used. If desired, you can form each ball into a more smooth circle after it has frozen again while the ball is in the plastic wrap. **A note about baking chocolates: I like to use 1/2 dark/bittersweet chocolate and 1/2 semisweet chocolate for children; you can use all dark chocolate if you like. Unsweetened chocolate is not recommended. Make sure to use good quality baking chocolate, whatever your choice. On the third day, after the combined ice cream balls have completely frozen through, they are ready to coat with chocolate. Microwave the chocolate and the canola oil in a small glass bowl (best) or glass measuring cup for about 2 minutes on medium heat (50%). Stir, and if all chocolate dissolves, set aside. Or microwave 30 seconds more, check and repeat as needed, until all chocolate is melted. After the chocolate has melted, let it cool slightly. This is a crucial step, because if the chocolate is too hot, it will melt the chocolate balls; if the chocolate cools too much, it will start to harden. A glass bowl is best for coating the ice cream balls because it can be put into the microwave to melt the chocolate again if it starts to harden before you are finished working with it. One at a time, take out an ice cream ball from the freezer, remove plastic wrap from the ice cream ball, and immediately place each ball into the chocolate, rolling the ball over once with a large spoon to coat the top and bottom of the ball. Immediately set each chocolate-covered ball onto a cookie sheet or small tray covered in aluminum foil and place back into the freezer. Repeat the last two steps until all ice cream balls have been coated with the chocolate. There will be just enough chocolate to coat 8 balls, so work quickly and reheat the chocolate as necessary, scraping down the sides of the bowl to use all the melted chocolate efficiently. Freeze all chocolate balls uncovered at least 2 hours. If you are not serving the tartufi right away, cover them lightly in aluminum foil or place them back into covered containers and store in the freezer. When ready to serve, cut each tartufo in half with a serrated knife and place on a small plate. Or place each tartufo ball as is in the center of a large fancy ice cream cup and watch everyone crack open the chocolate shell, dig in, and enjoy their summer treat! *To find Amarena cherries if you do not have an Italian specialty shop in your neighborhood, simply search online. 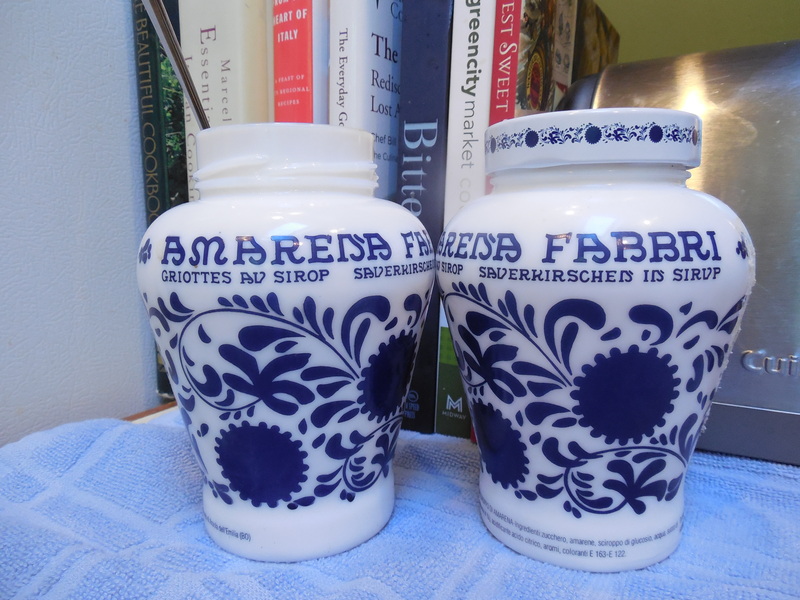 Look for the Fabbri brand pictured here. The cherries, in heavy syrup, come in a beautiful white-and-blue decorated jar. Save the jar when you have used all the cherries and use it as a lovely decorative glass piece to give your kitchen a true Italian flair. Gnocchi—light, airy dumplings perfect for your favorite Italian sauce! Gnocchi (pronounced (NYAAW – KEY) are Italian potato dumplings, and if made properly, they are said to be like little pillows: delicate and soft, and a delight to eat! 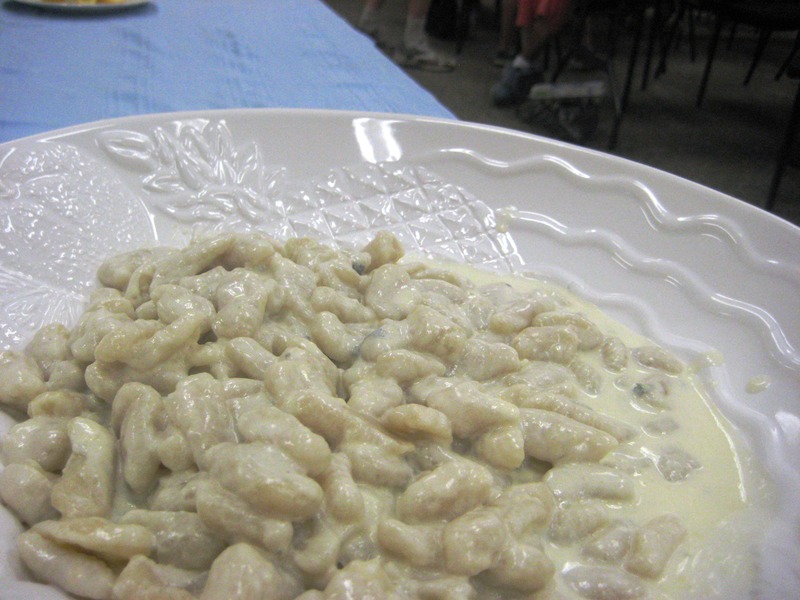 Gnocchi are popular in northern Italy and as far south as the Abruzzo region. The dough is prepared with just a few ingredients—potatoes, a bit of flour, and sometimes an egg. The dough is then kneaded gently, rolled out, and cut into bite-size pieces. At the end of the process, ridges are created by rolling each “gnocco” along a fork or specially carved small wooden board. These ridges are perfect for capturing the delicious butter sauce, Gorgonzola sauce, pesto, or tomato sauce they can be served with. To see the method to make gnocchi in detail, visit our Stella Lucente Italian Pinterest site. Italian families commonly gather around the kitchen table and make these treats together, often on a Sunday afternoon. 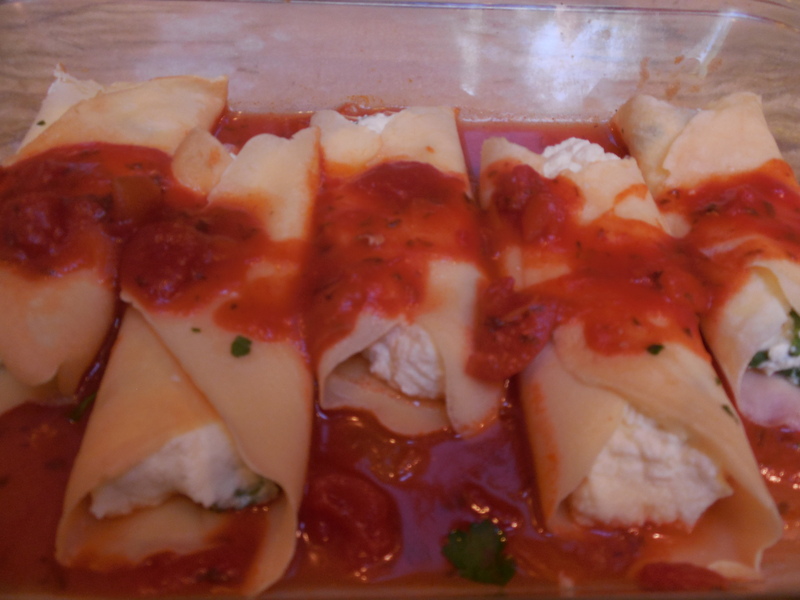 Make and enjoy these famous Italian dumplings one afternoon at your home for a special treat! The mashed/riced potatoes should be light and loose. Place 1 cup of flour on your work surface. Place your mashed/riced potato alongside in a separate pile. Spread out the mashed/riced potatoes, then sprinkle some of the flour onto the potatoes. Start working the two ingredients together. As soon as the flour is absorbed, add more flour until the mixture starts to create a workable dough. A light hand in mixing here will yield a tender dumpling. Do not over-knead! Gather the dough into a ball and cover for 10 minutes. This will allow the moisture from the potatoes to be absorbed by the flour. Knead the dough just enough to blend again; do not overwork. Slice off a quarter of the dough and start rolling it out to form a length of “rope” that is 1/2 inch thick. Cut the rope into 1/2- to 3/4-inch pieces and then process it by rolling the gnocchi beneath your finger, then quickly pulling it toward you until it has made a full turn and curled up a bit. To create ridges, use this same movement over the back of the tines of a fork or a specially ridged wooden gnocchi board. Fill a large pot with water about ¾ of the way to the top and add a generous amount of salt. Cover pot and bring to a boil. While the water is boiling, prepare your sauce. Turn the heat down, uncover, and add gnocchi gently. A large, flat, slotted serving spoon works best to lower the gnocchi safely into the water. Cook gnocchi for about 3–4 minutes. 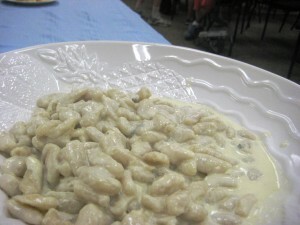 Watch the gnocchi as they cook, and when they float to the top of the water, gently lift them out with a slotted spoon. Melt the butter gently in a large, light-colored skillet or saucepan over very low heat. Turn the pan around on the burner as needed, so the butter melts at an even rate if you have an electric stove. After the butter has melted, keep the heat on low, but watch it carefully. It will start to turn brown. Swirl the melted butter in the pan gently to evenly distribute the heat. When the butter has turned light brown, immediately remove it from the heat. Add the salt and swirl to melt. Add the fresh torn sage leaves. Immediately pour over warm, just-cooked gnocchi waiting to be sauced in a serving bowl and mix gently to coat. Garnish with a sprig of sage and serve while hot. 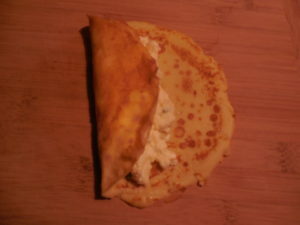 Place the butter, Gorgonzola cheese, and milk in a small saucepan. Add 1/4 teaspoon salt. Melt all ingredients together slowly over low heat while stirring gently to blend the Gorgonzola cheese with the other ingredients. When all has melted and blended together, taste and adjust salt. If the gnocchi are not ready at this time, turn off the heat. Then reheat sauce gently on low heat for about a minute and add the final ingredients. Add the heavy cream or half and half, mix to incorporate, and cook over medium heat, simmering the sauce to reduce and thicken it. Add the Parmesan cheese and cook over low heat to melt. Remove from heat and pour over warm, just-cooked gnocchi waiting to be sauced in a serving bowl and mix gently to coat. Braciole: It’s what’s for Sunday dinner! Italian beef rolls—involtini di carne, also known as braciole, bracioli, or bruciuluni (in Palermo Sicilian dialect)—are a favorite southern Italian treat that are often served for the Sunday family dinner. What I enjoy most about this dish is that there are so many different variations, and every family that makes braciole has its own special traditional recipe. I’ve found that a little bit of breadcrumbs and prosciutto make for the most flavorful braciole. My family hides a whole hard-boiled egg in the center for a surprise when the braciole is cut open. Other families chop the egg in half or into smaller pieces, and some families do not use egg at all! When I was growing up, I always knew it was Sunday from the wonderful fragrance of the pot of homemade tomato sauce cooking on the stove top that would slowly permeate every corner of our house. If we couldn’t wait for the sauce to finish cooking, a slice of Italian bread dipped in the sauce would serve to keep our appetites at bay until mom or grandma deemed it was finally perfect. Southern Italian tomato sauce is cooked at least an hour or so and usually longer when other meats are added to flavor the sauce. Every Italian family has its own special sauce that has been passed down for generations. I am including here the basic tomato sauce recipe from my family that I use to cook the braciole. Most Italians use only a little basil in their tomato sauce and sometimes some parsley, and I have included both herbs in the tomato sauce recipe below. The Italian motto seems to be “the less the better” when it comes to tomato sauce, although the ingredients used must be high quality. Oregano is a herb not generally found in tomato sauce in Italy, although legend has it that American soldiers brought oregano home after World War II, and it seems like the American families here have adopted this additional herb for their sauce in many parts of the country. Also, if good tomatoes or good tomato puree is used (with less acid), it is not necessary to add sugar to tomato sauce, but in some parts of America, a sweeter sauce is preferred. Growing up as I did in New York, we liked the Contadina brand of tomato products. There are as many variations as there are families in Italy and America, so make the pot of sauce your family has come to love, and enjoy a special Sunday together! Any thin, flat cut of beef stew meat can be used, such as top round. If you can, ask your butcher to cut the meat against the grain to make the thin cutlet slices, so that the meat will cook properly in the sauce and virtually melt in your mouth when it is done. At Caputo’s grocery stores in Chicago, the meat is nicely marbled and labeled “braggiola steak,” an Americanization of the original word, no doubt. 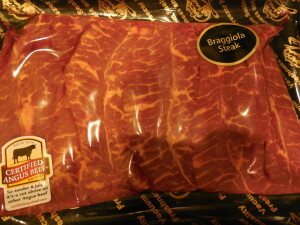 One package with four braciole cutlets, about 1.5 pounds for four people. 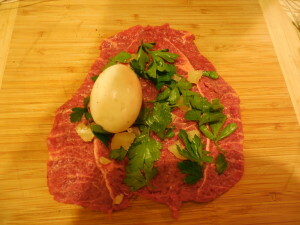 Lay the cutlets of meat out on a cutting board. Trim them to approximately the same rectangular size. 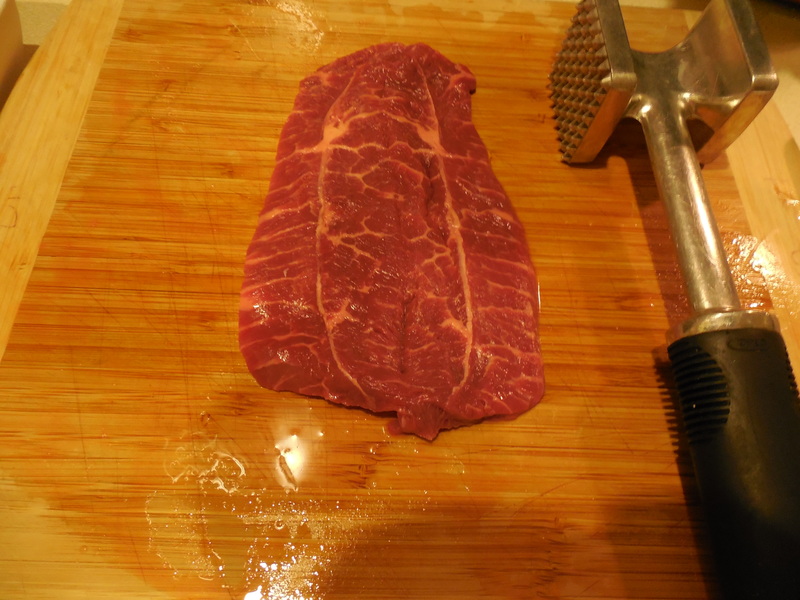 Tenderize and flatten slightly with a meat mallet. The braciole cutlet is rolled over the egg, with ends tucked in as you roll, and then tied with butchers twine. 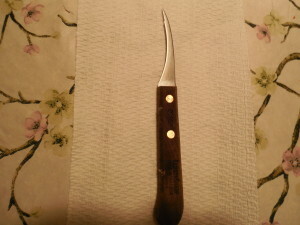 The ends also can be sealed with toothpicks. For more layers, roll along the short end; less layers, roll along the long end. To see step-by-step pictures of the methods for rolling a braciola, go to Stella Lucente Pinterest. 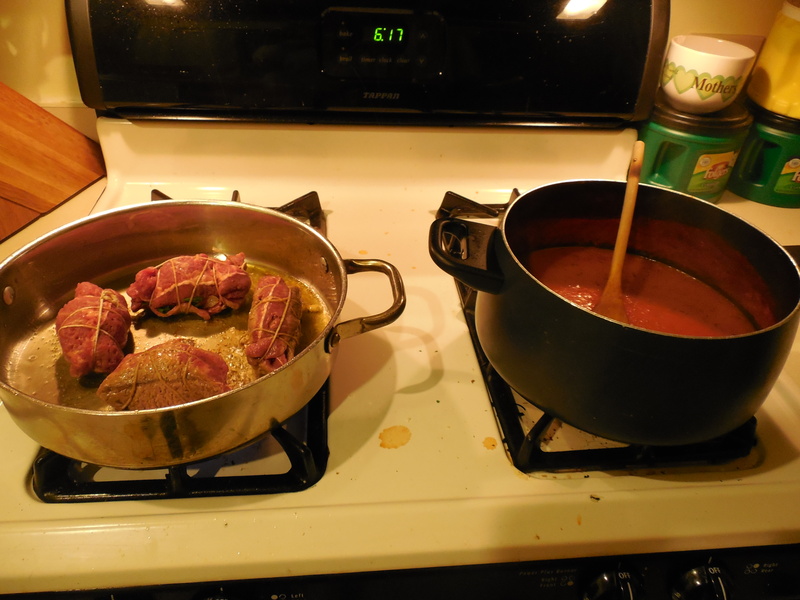 Brown each assembled braciola in a little olive oil in a frying pan. Turn so they brown nicely on all sides. Have sauce slowly boiling on the stove top. Gently lower the braciole into the sauce. Lower heat to a simmer and cook about 30 minutes to 1 hour, or until cooked through. Do not overcook, or the meat will become dry. While braciole are cooking in the sauce, set a large pot of salted water on the stove to boil and cook spaghetti or another pasta of your choice. Time the pasta so that it is hot and ready to be sauced when the braciole are done. 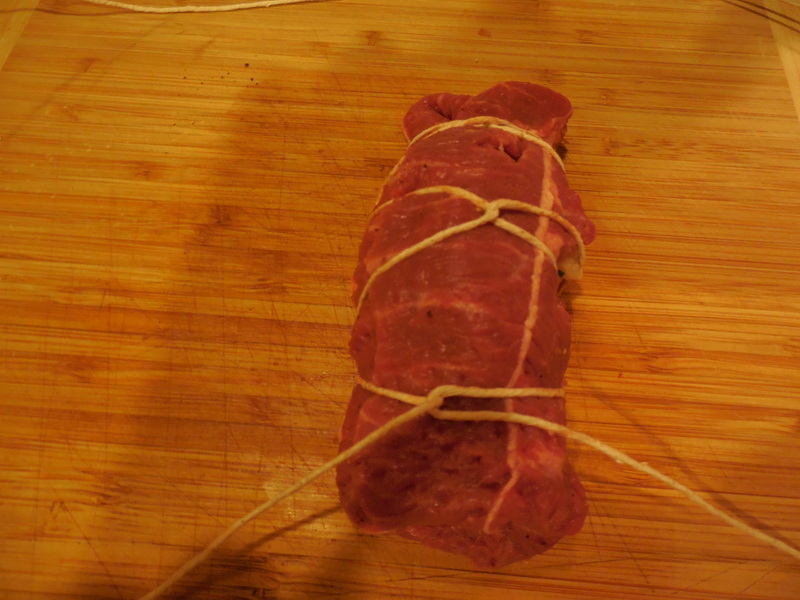 Remove the meat string or toothpicks before serving the braciole! Serve with your favorite pasta and extra sauce on the side. Pasta used for the picture in this blog is Mafaldine 81 from Divella, made in Italy. 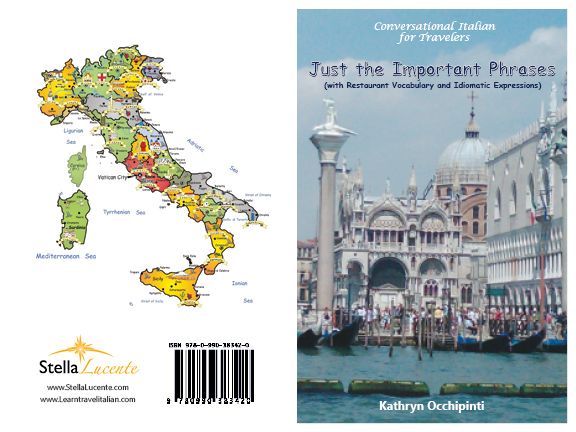 Kathryn Occhipinti, MD, author of the Conversational Italian for Travelers series is a teacher of Italian for travelers to Italy in the Peoria and Chicago area. It is amazing that a dish this simple can be so delicious. It is a real crowd-pleaser, loved by adults and children alike and perfect as the only dish or as one of several fish dishes (sometimes as many as seven!) served at an Italian-American Christmas Eve feast. 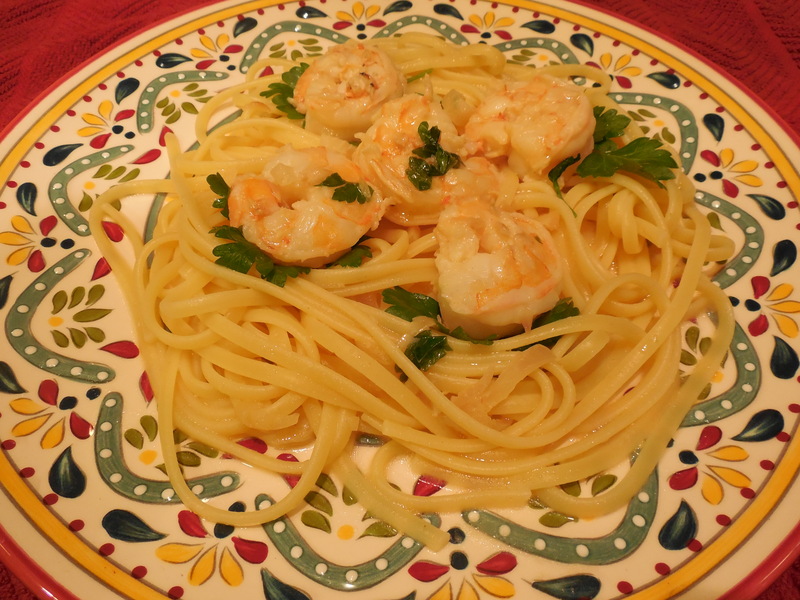 “Scampi style” in America just means that shrimp are cooked in a light sauce of garlic, butter, and white wine to a delightful tenderness and flavor. The Italian name “scampi” is the plural of “scampo,” which means “safety, salvation, or escape,” and the verb “scampare,” which means “to escape.” Regarding this dish, the word “scampi” cleverly refers to the tail of a certain small lobster found in the North and Mediterranean Seas. The French name is “langoustine” and the Spanish name is “cigala.” This small lobster (to get technical, the true name is Nephrops norvegicus) has meat in the tail section but not much in the claws. In the United Kingdom, “scampi”refers to the preparation of the whole tail of this lobster cooked in breadcrumbs, but tradition elsewhere renders “scampi” as a preparation of garlic, butter, and white wine. Try this easy-to-make dish this Christmas Eve and see for yourself how wonderful shrimp can taste! First, start to cook the linguine, and let the pasta cook as the sauce is being made. If you are lucky, it will all come together at about the same time! A general method for cooking pasta is as follows: set a large pot of well-salted water on the stove to boil, and at the rolling boil, add the pasta; stir; cover the pot to bring back to a boil quickly; uncover, stir, and cook until pasta is “al dente” (slightly firm). Drain and keep warm if pasta is ready before sauce is finished. 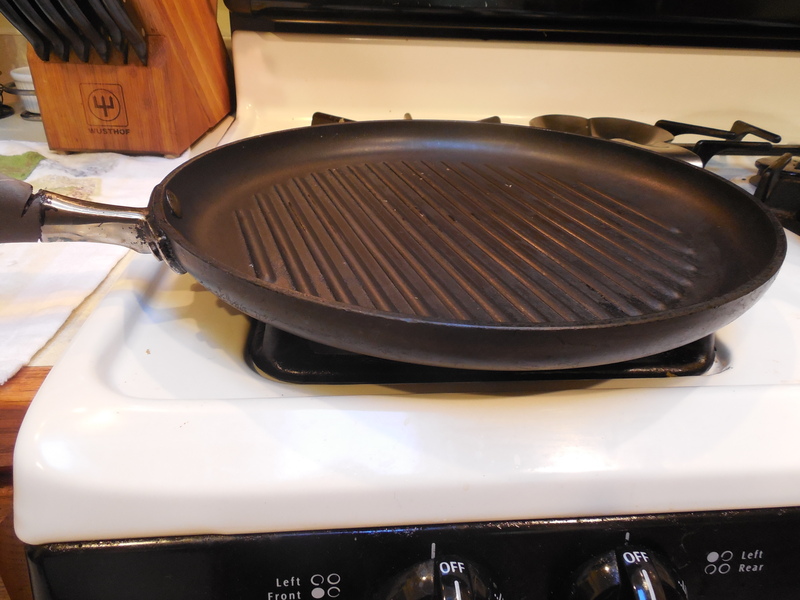 Set a large skillet with high sides or your largest frying pan on a burner over low heat. Watch the pan very closely from start to finish so that the shallots, garlic, and butter do not turn brown. The “sauce” will come together very quickly. Put the olive oil and shallots or onions and garlic into the skillet with the salt over medium heat and cook, stirring as needed, until they soften (do not let them brown). Add the butter and let it melt slowly. Cook until the onions and garlic are translucent (cooked through). Add the white wine and raise heat to boil down the alcohol in the wine and thicken the “sauce.” Boil down until about 3/4 cup of wine is left. Add the shrimp and cook briefly on each side (about 3–4 minutes) over medium heat, until they turn pink, turning and moving the shrimp in butter as needed. Do not overcook, or the shrimp will dry out and become rubbery. Taste and adjust salt and add a pinch of white pepper as needed. 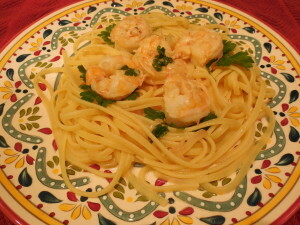 If too much wine has boiled off by the time the shrimp have cooked, add some pasta water. If the sauce seems a bit watery, take the shrimp out and boil down a bit more. Take pan off heat and add the chopped parsley. Enjoy over freshly cooked linguine. Because this is a delicate fish dish, no grated cheese topping is needed! *To get the best flavor from the shrimp in this dish, it is best to buy the shrimp raw and clean them, although shrimp can be bought already cooked and just warmed through in a pinch. When cleaning the shrimp, the veins along the outer and inner curves of the shrimp should be removed by making a slight cut and pulling each vein out. I have a shrimp knife for this task that I found in a specialty food catalog long ago that looks like this: and makes the work quick and easy. Kathryn Occhipinti, MD, is the author of Conversational Italian for Travelers and a teacher of Italian for travelers to Italy in the Peoria and Chicago area.